Home » Communications » Welcome to Allie Long, our new Digital Communications Coordinator! Welcome to Allie Long, our new Digital Communications Coordinator! We recently sat down with Allie Long, our newest staff member, to learn a little bit more about her! 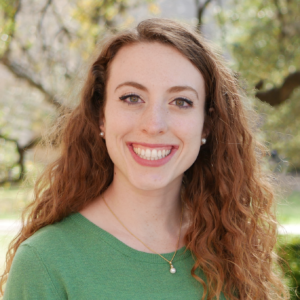 Allie is our Digital Communications Coordinator, and will oversee TXICFW’s written content via social media, website updates, and copy editing. She is a professional communicator with experience spearheading marketing efforts, strategic content, website curation, copy writing/editing, social media, and SEO-optimized work for a variety of non-profits, startups, universities, and professional organizations. We are so excited to have her on our team! To learn more about Allie, please visit her staff profile. I have the privilege of working with so many intelligent colleagues who are incredibly passionate about the research that they’re involved in. I firmly believe that communication sits at the fulcrum between research and empathy. Because of this, I’m looking forward to collaborating with the researchers around me in order to make their work even more accessible for parents, professionals, and practitioners throughout the state of Texas. There’s so much exciting work to be done when we think about the ways to positively alter our language and communication around sexual education, foster care, immigration, and other issues that social workers interact with daily. My overarching career goal is tied to my desire to contribute to creative platforms that empower traditionally marginalized voices so that they may freely and fully express their thoughts, ideas, and strategies for social welfare innovation. So basically, this job is my dream! I’m either daydreaming in the kitchen while concocting a new meal for friends and family, or taking long podcast walks around various neighborhoods in Austin! I also love to travel, read, and learn about coffee. So much of my job boils down to being present and simply listening. I personally think that’s a huge part of what makes a successful communicator! That said, if you’d like to get in touch with me— please do!